DCIP measurements are carried out by injecting current into the subsurface between two electrodes while measuring the potential between one or several other pairs of electrodes (Figure 1) (Fink, 1990; Sumner, 2012; Zonge et al., 2005). The aim of the measurements is to get information of the electrical resistivity and chargeability of the subsurface. Information from different subvolumes of the subsurface is retrieved by repeating the measurements with different electrode combinations. 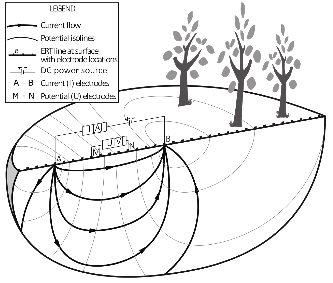 With electrode combinations arranged along a line, one or two-dimensional, depending on what combinations are used, information of the subsurface below the line can be retrieved. If the combinations instead cover an area it is possible to recover a three dimensional information volume (Loke and Barker, 1996). Compound-specific isotope analysis is used for tracking the in-situ degradation of the target compound, in this case tetrachloro ethene (PCE). Many factors will affect the concentration of PCE at a certain point, such as transport processes, dilution, sorption, and of course microbial metabolism of PCE. The strength of CSIA is its blindness towards everything but the actual degradation. 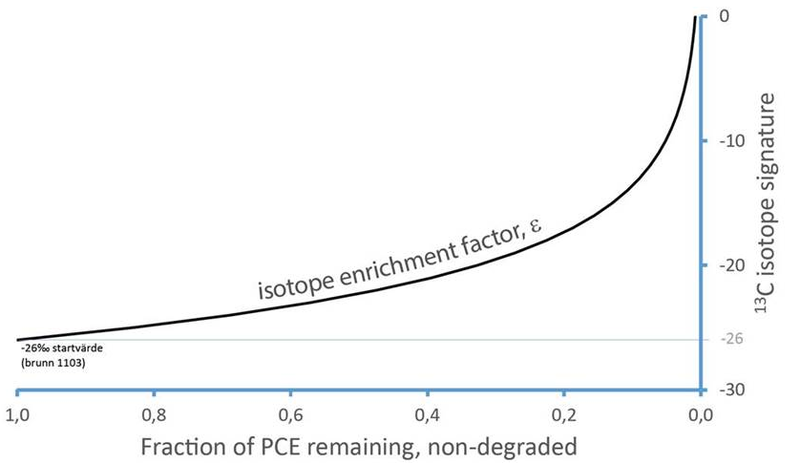 As the initial mass of PCE is degraded, it will become increasingly enriched in natural 13C isotopes (carbon constitutes the molecular backbone). This isotope shift is related to the extent of the degradation in a quantitative way, so that we may calculate the remaining fraction of non-degraded PCE at the field site. This specificity towards the degradation process makes for precise and reliable estimates of the remaining contaminant load. In order to verify if the detected anomalies are due to microbial activities the groundwater may be sampled for physiochemical characterisation and verification of microbiological activity of bacterial indicator species (Physical and BioGeochemical Characterisation, PBGC). Detection and enumeration of indicator species, such as Dehalococcoides sp, can be done by molecular methods such as quantitative polymerase chain reaction using species specific primers (e.g. Hargreaves et al. 2013 and Hedman et al. 2013). We will implement two types of groundwater monitoring; in-situ measurements of redox conditions via an oxidation-reduction potential/pH/temperature/electrical conductivity logger as well as classical groundwater sampling and analysis of the contaminants, degradation products, general characterisation of groundwater constituents and analysis of enumeration of bacterial indicators.